To be sure, I don’t think that sorrow and grief were part of God’s original plan because death and sin are not things that God created or ever designed for mankind. Physical death, however, is now a fact of life. If you’ve never lost a close friend or family member, it is difficult to imagine the level of emotional pain experienced by those they left behind. One would almost be tempted to extract Bible verses and preach a sermon about how our sorrow isn’t godly, because they are in a joyful place now. Or that they wouldn’t want us to grieve for them, they would want us to be happy for them. Perhaps in some way these statements are true: Christians who die are now eternally with Christ and they would want us to rejoice and not mourn. And yet, as with much of the advice received when one is mourning, these statements ring hollow. While likely meant to encourage, somehow they just are not very encouraging. As I read chapter 2 in Grieving with Hope, I realized why this is true. As with any emotion, when grief is not properly expressed it can be damaging to our body and spirit. I do not believe that grief is displeasing to the Lord. In fact, I believe God created grief as an emotion that we express when something that we loved, cherished and treasured deeply is gone. We opened our heart and we allowed it to love and become bonded, and now that bond is broken. The only natural emotion we’d feel is grief. But when out of misplaced theology we somehow belief that grief is displeasing to God, we fail to allow natural expression of our emotions. The problem is that failure to express grief doesn’t mean that grief is not present. It only means that grief has been suppressed and suppression of our emotions always leads to deeper physical emotional problems. The natural ebb and flow of essential hormones released during grief is interrupted. This process, created by God as a way to protect our bodies from breaking down due to unresolved stress caused from pain that we’ve failed to address has been hijacked from a faulty belief system that we don’t see anywhere in Scripture. On the opposite side of this is the tendency to overthink grief. There is the tendency to think that any release from the sense of grief and sorrow means that we didn’t adequately love the person we lost or that there is something wrong inside of us that has caused some sort of breakdown in our emotions. And yet, I don’t believe that God made the human body with the capacity to grieve long-term without respites along the way. The human heart cannot withstand the amount of pressure that is put on our physical bodies by unrelenting grief and sorrow. Our organs fail to keep up with the amount of hormones released by this ongoing grief, and they get fatigued and our bodies begin to break down. As with every emotion created by God, we must express grief through the prism of God’s Word. 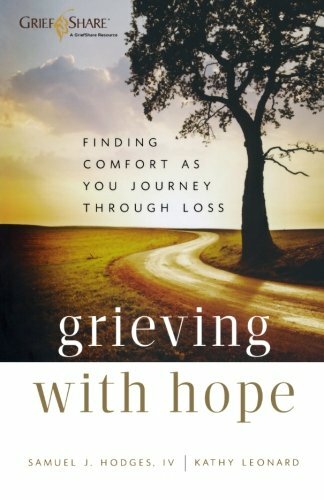 In the book Grieving With Hope, the writer reminds us to lean into the grief. We allow the waves to wash over us: we cry for our loss, we laugh at the precious memories we shared, we reminisce the good times, and then we let it go. We return to the cross because we can’t bear it alone. And I appreciate this, because I feel it is the best way we can grieve. We let our heart feel, but we don’t allow our heart to become overwhelmed to the point that we are incapacitated by it. While we grieve a lost one gone home to heaven because that bond we shared has now been broken, we must remember that they are not lost to us. They have left us, but only temporarily. We will see them again! Scripture reminds us over and over again that this world is not our home and the loss of a saint of God is precious in God’s sight. So, while we lean into grief, we run to the cross. We lean into the grief, and we let Christ bear it for us. We lean into the grief, and we rejoice that they have run the race, they have fought the good fight, they have kept the faith and now there is in store for them the crown of righteousness, which the Lord, the righteous judge, will award them on that day.